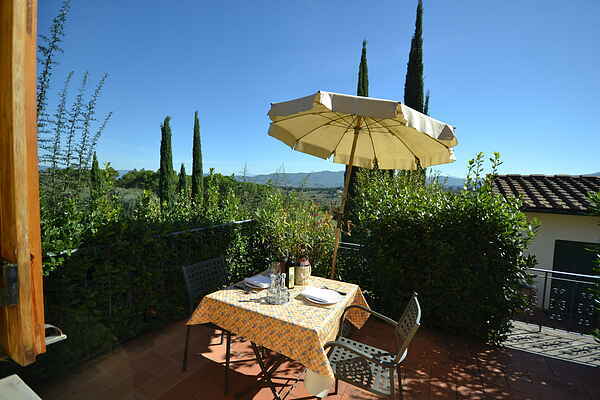 Set among the olive trees and vineyards of the enchanting Florentine hills, at 13 Kilometres from the historical centre of Florence, this farmhouse holiday centre is provided with two swimming pools. A beautiful Jacuzzi, on the open air, is available for all our guests. Inlabi is composed of a group of ancient country houses which have been renovated with full respect for age-old Tuscan achitectural traditions, maintaining the visible ceiling beams and baked tile floors, while the furnishings elegantly mirror the traditional style. Central heating ensures that you stay is pleasurable even in the colder months of the year. RiSTORANTE open from Easter to October from wednesday evening till sunday evening. November - December only on the weekends IMPRUNETA Impruneta is situated 13 Km south of Florence, on the beautiful hills between Greve Valley and Ema Valley. From here you can get Greve in Chianti, destination for all the lovers of wine, and follow the old road between wineyards and villages to Siena or San Gimignano, the old medieval town of the 15 towers. Impruneta has a very old tradition of terracotta jar, brick and tiles and religious little statues. You can visit some of furnaces and it’s very interesting to see how they make tipycal imprunetan’s decoration pot. In Impruneta’s furnaces the roof tiles of Florence’s Dome have been made! It also boasts a fbeautiful cathedral with famous pictures of Virgin Mary. In the main square there is a big weekly market. CHIANTI WINE The best grapes are selected and harvested from the farm’s vineyards. The wine is aged in oak barrels. It has a deep red colour and the traditional Chianti taste and goes excellently with main courses, roast meat and wild fowl. VIN SANTO Our vin santo (literally “sacred wine”) is made from white trebbiano and malvasia grapes, which are allowed to dry until the month of december. The ried grape must then ferments in oaks casks for at least four years. The taste is dry and pleasant and the wine is often consumed with home-made almond cookies or quality store-bought confectioneries. EXTRA VIRGIN OLIVE OIL The olive oil produced by the farm is extra-virgin and is produced in the farm’s own mill. The best olives are selected and are the cold-pressed. Widely esteemed, the oil is rich in nutrients and coserves the taste and typical characteristics of the best Chianti olive oil. VINO BIANCO Our white wine it’s refined and elegant bouquet, dry taste and excellent finish is best appreciated chilled with chicken and fish dishes. GRAPPA Grappa is also produced from the farm’s vineyards. It is created with a unique distillation process in copper pots and aged for three years in oak casks. It is a strong but refined grappa with well-balanced body and a distinctive taste.